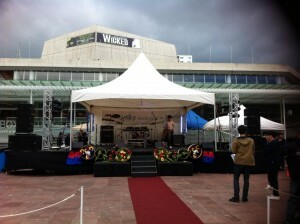 We can help you with our range of covered stage hire options available in and around Auckland. 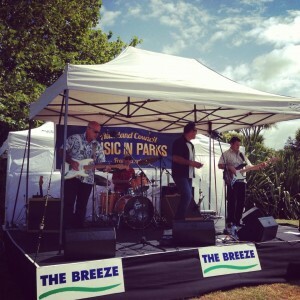 New Zealand weather is famous for having four seasons in one day during outdoor weather situations, because of this, a cover for your stage, if you are doing an outdoor event, is essential! Are you planning an outdoor event with a band playing or entertainers performing or dancing in a Park, school field or backyard? Keep your entertainment and their backline equipment happy in the shade or dry if there is rain! We have eight sizes of covered stage hire options for you to choose from… We can do a small, medium or large covered stage at various heights, scroll down to see more! NOTE: For health and safety reasons we do not dry hire the covered stages for outdoor events, we must set them up properly and safely for you. Our competent team has therefore been trained on the best practice procedures so that they can do it for you. The stages need to be set up as flat as possible to reduce tripping hazards and it needs to be clamped together appropriately and in the right spots. The cover marquee needs to be properly secured and weighted down to provide safe cover. The transport of these small stages requires a largish trailer or long wheel base van or small truck. The stated pricing is for within Auckland Delivered, setup, packed down and removed pricing, thus we supply 2 people and a van or truck to deliver, setup, packdown and remove). For out of town Delivered pricing ADD a per km price from Auckland + driver’s time + additional labour time for the helper – Please ask for a quote for confirmation of pricing on delivery out of Auckland. 3 by 3 stage with 3 by 3 marquee. 30, 50 or 60cm height. Will work for Duos or Trios, Perfect for the DJ or MC. Cover & safetys is $75+GST. 5 by 3 stage with 4.5 by 3 marquee. Will fit a standard 4 piece band on it. Transport requires a truck. This is within Auckland Delivered, setup, packed down and removed pricing (we supply 2 people and a truck to deliver, setup, packdown and remove). There are additional costs for setting up this stage outside the usual 20km radius of the Auckland CBD. Note this one has a pole in the middle at the front side so the singer would need to go slightly off center so he or she is not obscured. 50 or 90 cm in height. Cover and Safetys is $150+GST. No pole in the middle so the singer can be in the centre and is unobscured, this makes it a favourite for Mid sized outdoor gigs. 6 by 4 metre stage with 6×4 marquee. Cover and Safetys is $250+GST. Note this one has a pole in the middle at the front side so the singer would need to go slightly off centre so he or she is not obscured. 60cm or 90 cm height. Cover and Safetys is $300+GST. 7.2 x 6 meter OR 6 x 6 meter covered stage at 90cm height (with a 6 by 6 meter Springtop Marquee on top) This stage will fit large bands and kapa haka groups on it and therefore it is popular for cultural events. We use this outdoor covered stage for multi cultural days, wine and food festivals and fairs. 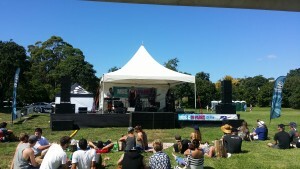 It is a good sized stage option for small to medium sized outdoor festivals or concerts in parks. 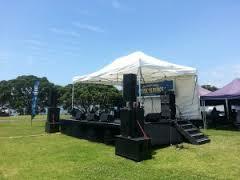 Check out our Outdoor Event Packages for sound systems that might work well with this stage. We supply 3 people and a truck to deliver, setup, packdown and remove these stages. For out of town Delivered pricing ADD a per km price from Auckland + driver’s time + additional time for the helpers. Please ask for a quote for confirmation of pricing if your event is not within 20km of the Auckland CBD. Cover and Safety is $300+GST. Delivery and Setup is $225+GST. Packdown and Removal is $225+GST. We recommend at least two strong people to lift each stage piece. 1. Lay out all the stage pieces upside down approximately where you want your stage to go. Choose the flattest place you can find as this will make set-up a lot easier. 3. With one person at each end of a stage piece, lift and then flip the piece onto its legs. 4. Align the pieces with no gaps, and if the ground is un-even put thin pieces of wood under any legs that aren’t touching the ground. 6. Put the marquee on top of the stage then open it out. Four people are recommended for this, but you can do it with two or three people by standing the marquee upright, clamping one corner to the corner of the stage it will be attached too, then using that point as an anchor as you gently move away from it with the other corners, opening out the marquee. 7. Click the top buttons of the marquee into place, clamp the feet to the stage and hang marquee back/sides if required. Loosely hang ratchet straps from the marquee before extending the legs to full height. 8. Extend the legs to full height (use four people to do this at once, or two doing one side then the other, hole by hole), then attach the bottom of ratchet straps to stage legs and very gently tighten. Do not over tighten and bend the marquee. 9. You may tape around the edge of the stage with white tape and along the joins with black tape. 1. Loosen ratchets then lower marquee legs. 2. Remove ratchets, backs, and sides, unclamp feet, then unclick marquee top. 3. Fold marquee inwards, put the cover back on (if supplied) then take marquee off the stage. 4. Remove any tape if you used tape. Go under the stage and remove all of the g-clamps. 6. Remove legs from each stage piece and return stage pieces to truck/trailer/van. 7. Don’t forget to return all the extras including any bits of wood used to prop up legs on uneven ground.